Kreuzen Sie drei der schönsten Reiseziele Rumäniens an einem Tag an, beginnend mit der imposanten Bauernzitadelle in Rasnov. Hören Sie die Mythen und wahren Geschichten, während Sie das Schloss Bran erkunden, das Bram Stokers Dracula beeinflusste. In der spektakulären königlichen Residenz Peles Castle, besuchen Sie sowohl das Äußere als auch das Innere in Ihrer Freizeit. Bewundern Sie die atemberaubenden siebenbürgischen Alpen und das Bucegi-Gebirge auf Ihrem entspannten Rückweg nach Brasov. This tour delivered in every way that we had hoped, and more. Our guide, Florin, was knowledgeable about so many elements of every destination, and was a joy to tour with. We would enthusiastically recommend this tour to anyone planning on spending time in the area. This was an outstanding tour. The communication with Florin was excellent before the tour. He informed us by email of additional details regarding our tour and by phone he informed us where we should meet. The tour itself was excellent. He is a very knowledgable and informative guide, he speaks excellent English and all aspects of the tour were very well organised and fascinating. He also gave us a really interesting insight into life in Romania, past and present. I would strongly recommend Florin and Flip Flop Tours for this or any other tour from Brasov. I understand that he conducts tailor made tours at clients request. If I had more time I would definitely have arranged a further tour with Florin. Our tour was excellent! We had the pleasure of having Florin as our tour guide. He gave us full information regarding each destination and when we got there he was subtle enough to let us enjoy what we were seeing and to provide us with full historical knowledge of everything we were witnessing. We started with Bran Castle, then Rasnov Fortress, then to beautiful Peles Castle! Florin provided us time to shop, take pictures, and even took pictures of me and my wife numerous times. He couldn't have been more accommodating, knowledgeable, and friendly! Highly recommend this tour and Florin Cristea for all your Romania tours!! El guía privado fue muy agradable y atento en todo momento con un idioma español perfecto, dejando un amplio margen de movimientos y tiempo suficiente para hacer fotografías y comer. Las visitas a los castillos de Bran y Peles y la fortaleza de Rasnov resultaron muy interesantes, a parte del interés propio de los castillos, disfrutamos de las expléndidas vistas de las montañas de su entorno. I cannot recommend this tour enough! Florin is incredibly bright, personable, and professional. He is the owner of Flip Flop tours and made a point to make us comfortable and educated. One person cancelled at the last minute, so my fiancé and I had a private tour with this passionate guide. He is easily our best tour of our trip. Floren took us to visit the castles and it was such a fun day. The beauty and history of these are phenomenal. We even had authentic, delicious, wood-fired pizza on the way back. A must for anyone visiting Brasov. We had the best day thanks to such a wonderful tour and a super nice, extremely knowledgable tour guide! Much thanks to Flo for his informative and fun tour of beautiful Brasov and surrounding area! There is no better tour guide anywhere! Flo met us on time and we enjoyed getting to know him throughout our day. We had done our research before visiting Romania, but to hear first hand experience about what it was like to grow up in this country, made this tour extra special. At each place we visited, we learned more about the specific place and the whole country. Flo seemed to know people everywhere we went and was greeted warmly. We felt like we were in company with a local celebrity and it was obvious that he has friends all over. We went first to Bran Castle so we could avoid the weekend mid-day crowds. That was a perfect suggestion as it started to get busier as we left. Our second stop was at Rasnov fortress. We walked to the top and had the best view of the surrounding mountains and forests. Lastly, was the impressive Pelles Castle. Having lived in Europe for 8 years now, we have seen a lot of castles. But there was something extra special about this one. Flo was so knowledgable about each place and went above and beyond to teach us about where we were. When the day was finished, Flo recommended a restaurant that he has no affiliation with but is a personal favorite and we had the best meal of our entire trip at that restaurant. Thank you for a fabulous day! Viator is fortunate to have such wonderful tour guides such as Flo! He made our day very special for us! Our guide Florin was fabulous, just as entertaining as knowledgeable about this tour. Great people's skills, we felt welcomed and well taken care of. 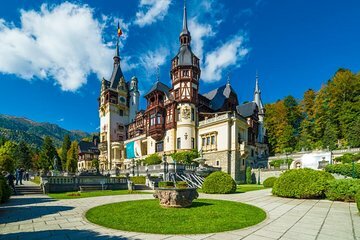 We wished we could've spend more time at each site, especially Peles Castle, but there is so much to see and do in one day with this tour, it was certainly very well planned and timed perfectly. Their little bus is very comfortable, and we felt safe at all times. 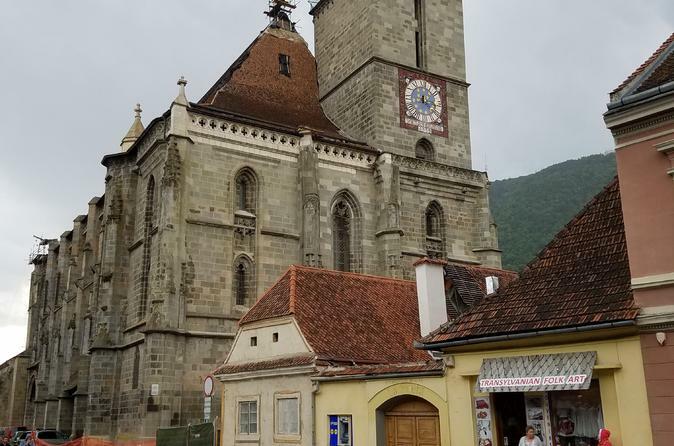 I highly recommend this tour and tour company, Flip-Flop Tour, if they are available, they can arrange other tours for you in and around Brasov. If you get the chance, take advantage of it, we weren't able to but wish we could! This tour was amazing, the castles are awesome, the guide is very kindness and bring a lot of information, 100% recommend.